GPCRs play critical roles in cell communication. Although GPCRs can form heteromers, their role in signaling remains elusive. Here we used rat metabotropic glutamate (mGlu) receptors as prototypical dimers to study the functional interaction between each subunit. mGluRs can form both constitutive homo- and heterodimers. Whereas both mGlu2 and mGlu4 couple to G proteins, G protein activation is mediated by mGlu4 heptahelical domain (HD) exclusively in mGlu2-4 heterodimers. Such asymmetric transduction results from the action of both the dimeric extracellular domain, and an allosteric activation by the partially-activated non-functional mGlu2 HD. G proteins activation by mGlu2 HD occurs if either the mGlu2 HD is occupied by a positive allosteric modulator or if mGlu4 HD is inhibited by a negative modulator. These data revealed an oriented asymmetry in mGlu heterodimers that can be controlled with allosteric modulators. They provide new insight on the allosteric interaction between subunits in a GPCR dimer. Many cell surface receptors form multi-protein complexes for signaling integration (Klingenberg, 1981; Salter, 2003; Altier et al., 2006; González-Maeso et al., 2008). Among them, G protein-coupled receptors (GPCRs) are the most abundant and constitute the main targets in drug development (Lagerström and Schiöth, 2008). Although most GPCRs can signal in a monomeric form (El Moustaine et al., 2012; White et al., 2007; Whorton et al., 2007), increasing studies revealed that they can associate into both homo and heteromeric complexes (Prezeau et al., 2010; Ferré et al., 2014; Gomes et al., 2016; Maurel et al., 2008; Albizu et al., 2010). Interestingly, GPCR heteromers may generate original functional pharmacological entities different from each of the homomers (Ferré et al., 2014; Gomes et al., 2016; Bellot et al., 2015; Wertman and Dupré, 2013; Fribourg et al., 2011; Urizar et al., 2011). Whether such GPCR association is real in native tissue is still a matter of intense debate (Bouvier and Hébert, 2014; Lambert and Javitch, 2014). Understanding how a receptor can control the activity of its partner (González-Maeso et al., 2008; Albizu et al., 2010; Fribourg et al., 2011; Vilardaga et al., 2008; Han et al., 2009) will certainly help clarify this important issue, opening ways to control the function of GPCR heteromers. Metabotropic glutamate receptors (mGluRs) are class C GPCRs and are well-recognized constitutive homodimers (Kniazeff et al., 2011; Pin and Bettler, 2016). These receptors are divided into three groups: group I (mGlu1,5), II (mGlu2,3) and III (mGlu4,6,7,8), on the basis of sequence homology, pharmacological profile and cellular signaling. Recently, mGluRs were shown to also form heterodimers with specific subunit composition (Doumazane et al., 2011; Kammermeier, 2012). Of note, whereas the different mGluRs were commonly described as having specific brain distribution supporting their homodimeric nature, localization studies revealed subcellular co-localization of different mGluRs such as mGlu1 and 5 (Pandya et al., 2016), mGlu2 and 4 (Yin et al., 2014), mGlu7 and 8 (Ferraguti et al., 2005). Further studies supported the existence of mGlu2-4 and 1–5 heterodimers in the brain (Pandya et al., 2016; Yin et al., 2014; Moreno Delgado et al., 2017). Being identified very recently, not much is known about the possible clinical relevance of mGlu heterodimers, but already homodimeric mGlu4, rather than heterodimeric mGlu2-4, were proposed as a better target for Parkinson’s disease treatment (Niswender et al., 2016). In contrast, mGlu2-4 heterodimers control synaptic activity at the level of the cortico-striatal terminals in the striatum (Yin et al., 2014) and lateral perforant path terminals in the dendate gyrus (Moreno Delgado et al., 2017). The mGlu subunits are multidomain proteins composed of a Venus flytrap domain (VFT) containing the orthosteric binding site, connected via a cysteine-rich domain (CRD) to a heptahelical domain (HD) involved in G protein coupling (Pin and Bettler, 2016; Wu et al., 2014; Doré et al., 2014; Kunishima et al., 2000; Tsuchiya et al., 2002). In the case of mGlu homodimers, structural and biophysical studies revealed a symmetrical conformational change during activation at the level of the VFTs (Doumazane et al., 2013; Rondard et al., 2006; Huang et al., 2011; Xue et al., 2015; Olofsson et al., 2014; Vafabakhsh et al., 2015). Indeed, while activating one VFT is sufficient to partially activate the homodimers, activating both VFTs is required for full activity both in homodimeric (Kniazeff et al., 2004; Brock et al., 2007; Levitz et al., 2016) and heterodimeric receptors (Moreno Delgado et al., 2017). Surprisingly, this symmetric activation of the VFT dimer leads to an asymmetric activation of the HD dimer, only one HD being active at a time (Hlavackova et al., 2012; Hlavackova et al., 2005; Goudet et al., 2005). Whether mGlu heterodimer activation is symmetric or asymmetric, and whether either subunit can be involved in signaling remains unknown. Such analysis will likely bring interesting observation for the understanding of the allosteric coupling between GPCRs within hetero-complexes. In this study, we choose mGlu2-4 heterodimer as a prototype heterodimer, as its existence in the brain has been documented (Yin et al., 2014; Moreno Delgado et al., 2017). We show that whereas both mGlu2 and mGlu4 HDs are capable of activating G proteins, only mGlu4 HD does it in mGlu2-4 heterodimers. Although a conformational change in the mGlu2 HD occurs that can be prevented by a mGlu2 negative allosteric modulator (NAM), it is not sufficient for a direct activation of G proteins, but important for the G protein coupling by the associated mGlu4 HD. This further documents the asymmetric activation of dimeric GPCRs. Furthermore, we demonstrated that manipulating the conformation of either mGlu2 or mGlu4 HD with positive and negative allosteric modulators can reorient the asymmetry towards mGlu2 activating G proteins. This demonstrates a differential ability of mGlu2 and mGlu4 HD to reach a G protein activating state. But most importantly, these data reveal strong allosteric interactions between two GPCRs in a dimeric complex. Such allosteric coupling can be controlled with small molecules allosteric modulators revealing a way to modulate heteromeric receptor activity, and expanding the possibilities of using such small molecules to precisely control signaling events. This illustrates how such hetero-complexes can control signals originating from various GPCR ligands targeting a cell. The difficulty in studying GPCR heterodimers is that the co-expression of two different receptors leads to three populations of dimers, both homodimers and the heterodimer, making difficult the study of the specific properties of the heterodimeric entity. We then used a quality control system that allows cell surface targeting of the heterodimer only (Brock et al., 2007). We engineered chimeric mGlu2 and mGlu4 subunits containing complementary coiled-coil regions (C1 and C2) derived from the GABAB receptor and intracellular retention signals (KKXX) (Huang et al., 2011; Kniazeff et al., 2004). We constructed mGlu2 and mGlu4 mutants with either C1 or C2, such as HAmGlu2C1KKXX (2C1), FlagmGlu2C2KKXX (2C2), HAmGlu4C1KKXX (4C1) and FlagmGlu4C2KKXX (4C2). By combination of C1 and C2 containing subunits, we can obtain the mGlu2-4 heterodimers specifically at the cell surface, as well as the mGlu2 (2-2) and mGlu4 (4-4) homodimers as controls (Figure 1A,B). mGlu4 activates G protein in the mGlu2-4 heterodimer. (A) Cartoons illustrating mGlu2 and mGlu4 homodimers, and mGlu2-4 (2–4 or 4–2) heterodimers with each subunit carrying the quality control C1 or C2 system as C terminal tails, and the indicated HA or Flag tag at their N terminus. (B) Quantification of cell surface expressed HA-tagged or Flag-tagged constructs by ELISA on intact cells transfected with the indicated subunits (2C1, 2C2, 4C1, 4C2) alone or together. Data are expressed as means ± SEM (n ≥ 3). **p<0.01, ***p<0.001 (unpaired t test). (C, D, E, F) Intracellular Ca2+ responses mediated by the indicated subunits upon stimulation with increasing concentrations of glutamate, in the presence of the chimeric Gqi9, with the control subunits (C), the mGlu2 homodimer with no, one or both subunits mutated (D), same with mGlu4 homodimer (E) or mGlu2-4 heterodimer (F). The red cross indicates the subunit carries the FS mutation that prevents G protein activation. Data are expressed as means ± SEM of triplicates from a typical experiment repeated at least three times. Such receptor constructs retained their ability to activate G proteins (we used the chimeric Gqi and Gqo proteins that enable coupling of these receptors to the PLC pathway [Conklin et al., 1993; Blahos et al., 1998]) when at the cell surface, with the expected action of mGlu2 (DCG-IV) and mGlu4 (L-AP4) selective agonists (Figure 1—figure supplement 1). When activated with glutamate, mGlu2 and mGlu2-4 displayed a similar potency and efficacy, while glutamate had a lower efficacy at mGlu4 (Figure 1C, Figure 1—source data 1). Note that all these receptor combinations were expressed at a similar level at the cell surface (Figure 1B). Mutating the conserved Phe residue into Ser in the third intracellular loop of mGluRs abolished their ability to activate G proteins (Kniazeff et al., 2004; Hlavackova et al., 2005). When introduced into the C1 and C2 constructs, neither mGlu2-F756S, nor mGlu4-F781S activated G proteins (Figure 1D,E). When only one subunit carries the mutation, a larger decrease in glutamate efficacy was observed in mGlu2 dimers than in mGlu4 dimers (Figure 1D,E, Figure 1—source data 1). When such mutation was introduced in the mGlu2 subunit of the mGlu2-4 heterodimer, a glutamate-mediated response similar to the control was observed (Figure 1D,F, Figure 1—source data 1). In contrast, in the heterodimer containing the mutated mGlu4 subunit no response could be observed (Figure 1F) despite a correct expression level at the cell surface (Figure 1—figure supplement 2). As a control, introducing the FS mutation in both subunits of mGlu2-4 heterodimer abolished glutamate-induced G protein signaling (Figure 1—figure supplement 3A). Even when the selective mGlu2 and mGlu4 agonists DCG-IV and L-AP4 were used, signal could be generated with the heterodimers mutated in the mGlu2 subunit, but not in those mutated in the mGlu4 subunits (Figure 1—figure supplement 3B–D). Such data strongly suggest that in the heterodimer, G protein activation is exclusively mediated by mGlu4 HD. Of note, similar results were obtained with either mGlu2C1-4C2 or 4C1-2C2 heterodimers, indicating that the modified C terminal domains do not influence the asymmetric activation (Figure 1C,F). In order to understand how a symmetric mGlu2-4 activation at the level of the VFT dimer could control an asymmetric activation of the HD dimer, we examined whether this could result from the specific association of one HD with its extracellular domain (ECD, composed of the VFT and the CRD). We then generated various constructs leading to the surface expression of receptor combinations composed of a 2–4 heterodimeric HD, but carrying either two mGlu2 ECDs (2-2ECD4HD; Figure 2A), two mGlu4 ECDs (4-4ECD2HD; Figure 2B), or in which the ECDs were swapped between the two subunits (2ECD4HD-4ECD2HD; Figure 2C). Constructs leading to the receptor combinations containing two mGlu2 VFTs (Figure 2—figure supplement 1A), two mGlu4 VFTs (Figure 2—figure supplement 1B), or in which the VFTs were swapped between the two subunits (Figure 2—figure supplement 1C) were also generated. For any of these combinations, we also analyzed the functional consequence of mutating either the mGlu2 or mGlu4 HD (Figure 2 and Figure 2—figure supplement 1). Thanks to the C1 C2 terminal tails, a correct and specific expression of any of the indicated dimer combinations at the cell surface could be verified thanks to the HA or Flag N-terminal epitopes (Figure 2—figure supplements 2 and 3). Asymmetric transduction results from the HDs in the mGlu2-4 heterodimer. In (A), (B) and (C) cartoons illustrating the heterodimer combinations used with one or both subunits carrying the FS mutation (red cross) that prevents G protein activation are indicated on the top. For each subunit, white domains are from mGlu2, while the grey domains are from mGlu4. The chimeric protein made of mGlu2 ECD and mGlu4 HD is named 2ECD4HD and the reverse chimera named 4ECD2HD. The intracellular Ca2+ responses mediated by the indicated subunit compositions (color coded, as indicated on top of the cartoons) upon stimulation with DCG-IV (30 μM), L-AP4 (30 μM) or glutamate (1 mM) shown at the bottom. (A) Data obtained with heterodimers containing both ECDs (VFT and CRD) from mGlu2. (B) Data obtained with heterodimers containing both ECDs from mGlu4. (C) Data obtained with heterodimers in which the ECDs were swapped between the two subunits. Data are means ±SEM (n ≥ 3). **p<0.01, ***p<0.001 (unpaired t test). When activated by glutamate, we found that any combination carrying a wild-type mGlu4 HD (with or without a mutated mGlu2 HD) generated Ca2+ signals (Figure 2 and Figure 2—figure supplement 1). In contrast, none of those carrying a mutated mGlu4 HD were functional (Figure 2 and Figure 2—figure supplement 1) despite their expression at the cell surface (Figure 2—figure supplements 2 and 3). Similarly, activating specifically the mGlu2 VFT with DCG-IV, or the mGlu4 VFT with L-AP4 led to G protein signaling of receptor combinations carrying at least one mGlu2 VFT, or one mGlu4 VFT, respectively, as long as the receptor contained a wild-type mGlu4 HD. No response could be generated with these agonists in receptor combinations carrying a mutated mGlu4 HD (Figure 2 and Figure 2—figure supplement 1). Constitutive activity of disulfide-tethered mGlu2-4 heterodimer is mediated by the mGlu4 subunit. (A) Cartoons illustrating the heterodimer combinations used with mGlu2 or mGlu4 subunits carrying the FS mutation (red cross) that prevents G protein activation (top). The red line linking both CRDs indicates the disulfide bridge that constrains the dimer into an active state. Inositol phosphate (IP) accumulation in cells expressing the dimer combinations after incubation with or without glutamate (1 mM). Data are means ±SEM (n ≥ 3). ***p<0.001 (unpaired t test). (B) On the top, the cartoons indicate the heterodimeric combinations analyzed by western blots (bottom) with or without DTT treatment. The natural inter-subunit disulfide bridge in the control dimer (wt) is indicated in (a), leading to the lack of monomers in the non-reducing conditions. When mutating both Cys involved in this natural crosslink (C121A in mGlu2 and C136A in mGlu4), both subunits can dissociate into monomers even in the absence of DTT (b). Adding a new disulfide bridge in the CRD (L521C in mGlu2 and H523C in mGlu4) (c) restores the subunit cross-linking. By using SNAP-tag labeling with a cell-impermeant fluorescein substrate, only the cell surface subunits are labeled, and then detected on the blot. Data are from a typical experiment repeated three times. Taken together, these results demonstrate that any ways the dimeric ECD of the mGlu2-4 heterodimer is activated the mGlu4 HD is always responsible for G protein activation. This strongly suggests that the asymmetric activity of the mGlu2-4 HD dimer is an intrinsic property of this membrane part of the receptor. Although mGlu2 HD is not directly responsible for G protein activation in the mGlu2-4 heterodimer, it may still play a role in the activation process. We then used MNI137, an mGlu2 NAM (Hemstapat et al., 2007) known to stabilize the mGlu2 HD in its inactive conformation. We found that MNI137 partially inhibited mGlu2-4 heterodimer while it largely inhibited the response of the mGlu2 homodimer, whether the dimer was activated by glutamate (Figure 4A, Figure 4—source data 1) or was constitutively active through the inter-CRD disulfide bridge (Figure 4B, Figure 4—source data 2). Of note, similar data were obtained in a receptor combination in which the mGlu2 subunit is incapable of G protein coupling. This revealed that a conformational change in the mGlu2 HD prevented by MNI137 binding is required to fully activate the mGlu4 HD. Allosteric regulation of mGlu4-induced signaling by mGlu2 HD. In each panel, cartoons (color coded) illustrating the dimer compositions used are indicated on the top, and intracellular Ca2+ responses mediated by indicated dimer combinations upon stimulation with glutamate (1 mM) and increasing concentration of the mGlu2 NAM, MNI137 (purple square). The inactivating FS mutation is shown as a red cross. (A) Effect of MNI137 on homodimeric mGlu2 and mGlu4 receptors, and on the mGlu2-4 heterodimer carrying or not the FS mutation in the mGlu4 subunit activated by glutamate (blue arrow). (B) Effect of MNI137 on the constitutively active dimers resulting from the CRD disulfide cross-linking. (C) Effect of increasing concentrations of MNI137 on the mGlu2-4 heterodimer activated by the mGlu2 agonist DCG-IV (30 μM, green arrow), L-AP4 (30 μM, red arrow) or both. (D) Intracellular Ca2+ response under control condition, or after stimulation with DCG-IV (30 μM, green arrow) with or without MNI137 (10 μM) with the indicated dimer combinations. Data are means ±SEM of triplicates from a typical experiment repeated at least three times (A, B, C), or from three independent experiments (D). ***p<0.001 (unpaired t test). To clarify how mGlu2 HD in the heterodimer controls mGlu4 HD activation, we activated the heterodimer with specific agonist of either mGlu2 or mGlu4. 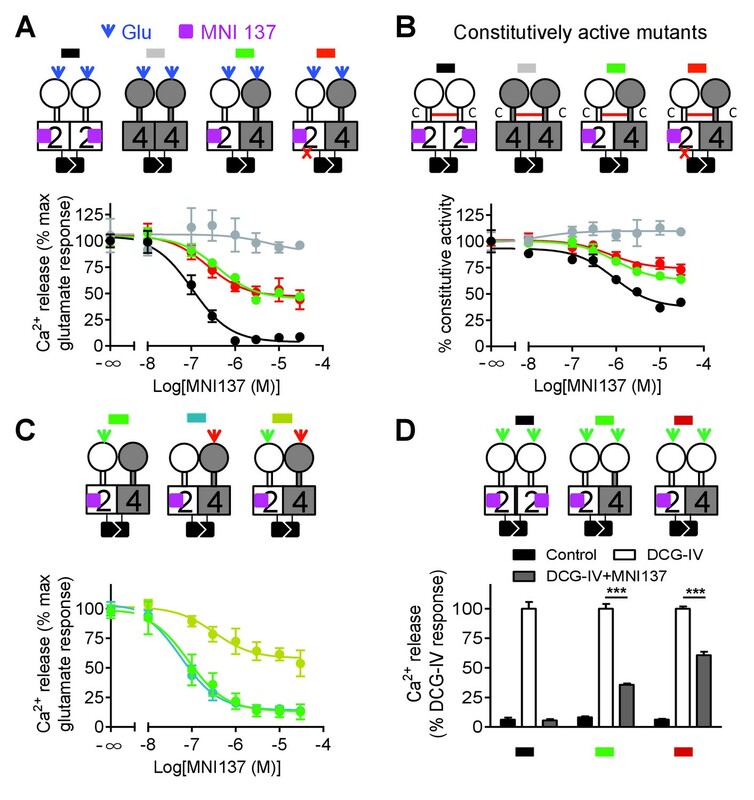 Interestingly, we found that MNI137 blocked mGlu2-4 heterodimer signaling induced by either DCG-IV or L-AP4 respectively whereas MNI137 inhibited only partially signaling induced by the combination of DCG IV and L-AP4 as observed with glutamate (Figure 4A,C, Figure 4—source data 3). These data revealed the prominent role of mGlu2 HD in activating mGlu4 HD when only one VFT is activated. Consistent with this conclusion, activation of both VFTs with DCG-IV in receptor combinations containing two mGlu2 VFTs is only partially inhibited by MNI137, with a smaller inhibition (39.2 ± 4.7%, n = 3) when both CRDs are from mGlu2, compared to the situation where the mGlu4 HD is associated with the mGlu4 CRD (64.3 ± 3.8% inhibition, n = 3, p<0.05) (Figure 4D). We then examined why mGlu2 HD could not mediate G protein activation within the mGlu2-4 heterodimer. We first analyzed the effect of an mGlu4 NAM (OptoGluNAM4.1) that we recently reported to prevent mGlu4 HD activation (Rovira et al., 2016). Surprisingly, this compound, while inhibiting agonist-mediated mGlu4 activity (Rovira et al., 2016), had no effect on the mGlu2-4 heterodimer (Figure 5A). 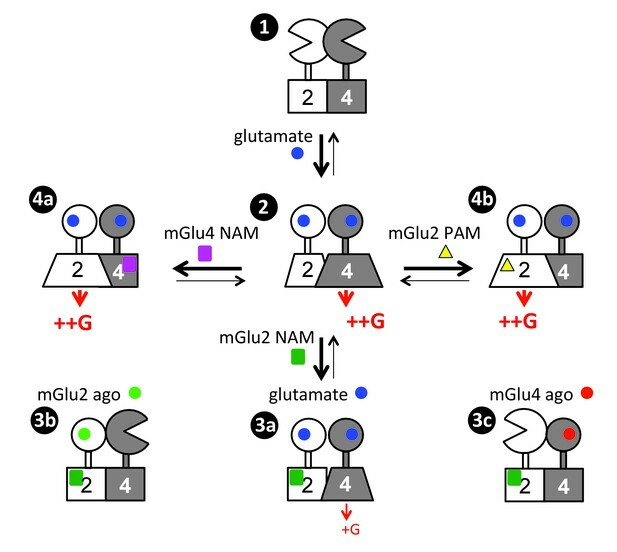 Most interestingly, when using an mGlu2-4 combination in which the mGlu4 HD is unable to activate G protein, then a heterodimer unable to activate G proteins, the addition of OptoGluNAM4.1 allowed glutamate to generate a signal (Figure 5A, Figure 5—source data 1). This suggests that, by preventing mGlu4 HD to reach its active state, mGlu2 HD can take over for G protein activation in the heterodimer. Switching of the G protein coupling subunit in the mGlu2-4 heterodimer by mGlu2 PAM and mGlu4 NAM. Intracellular Ca2+ response mediated by the indicated subunits upon stimulation with increasing concentration of glutamate with/without a mGlu4 NAM (optoGluNAM4.1, purple square, 30 μM) or a mGlu2 PAM (LY487379, yellow triangle, 10 μM). (A) The mGlu4 NAM allows mGlu2 HD coupling to G proteins in the heterodimer. (B) The mGlu2 PAM allows mGlu2 HD coupling to G proteins. Data are means ±SEM of triplicates from a typical experiment repeated at least three times. Such a proposal is supported by a second set of experiments, in which we favored mGlu2 HD activation in the mGlu2-4 heterodimer using the mGlu2 PAM LY487379. This compound had no significant effect on the mGlu2-4 heterodimer signaling capacity (Figure 5B, Figure 5—source data 1) or on the mGlu2-4 heterodimer mutated in mGlu2 HD (Figure 5—source data 1). However, on the non-functional mGlu2-4 combination where the mGlu4 HD is mutated, the mGlu2 PAM LY487379 allowed glutamate to activate G proteins, therefore revealing a possible coupling of the mGlu2 HD in this heterodimer. 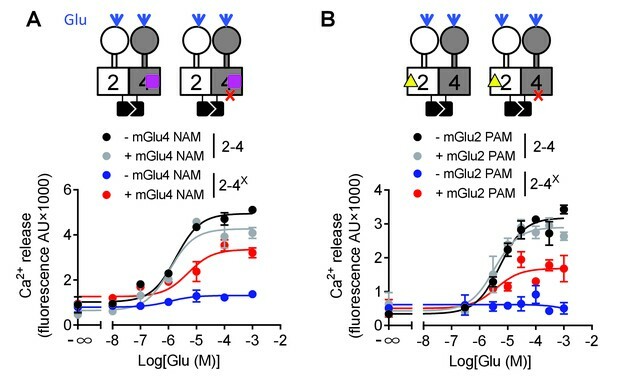 Taken together, these data revealed that under normal conditions, the coupling of mGlu2-4 is mediated by mGlu4 HD, but the mGlu2 HD can still generate signaling providing its activation is facilitated by a PAM, or by the inhibition of mGlu4 HD with a NAM (Figure 5). The above data were generated using mGlu2 and mGlu4 subunits carrying a modified C-terminal tail containing a quality control system. We then used another approach to validate our observation not only with mGlu2 and mGlu4 subunits with unmodified C-terminal tails, but also with other possible combinations of mGlu heterodimers (Figure 6). To that aim, we co-expressed two subunits, with one carrying the mutation preventing G protein activation. By specifically activating this mutated subunit, a functional response may only be generated with the heterodimer containing the wild-type subunit, providing the latter can be responsible for G protein activation in the heterodimer. Asymmetric transduction by mGlu2-groupIII heterodimers. (A–B) schemes illustrating the method used to study the coupling properties of mGlu heterodimers composed of mGlu2 (group-II) and a group-III subunit with the wild-type C-terminal tails. In (A), activating specifically the mGlu2 subunit unable to activate G protein (F756S, red cross) can generate a signal only if associated with a functional group-III subunit. (B) Same as in (A) with the inactive group-III subunit (F781S, F773S, F784S, F777S in mGlu4-6-7-8, respectively) and a specific group-III agonist. (C–F) functional coupling of the indicated subunits under the condition indicated on the top (black, control; green, group-II agonist (DCG-IV, 30 μM); blue, group-II agonist with mGlu2 NAM (DCG-IV, 30 μM and MNI137 10 μM); red, group-III agonist (L-AP4, 30 μM for mGlu4-6-8, LSP4-2022, 300 μM for mGlu7). (C) Data obtained with cells expressing both mGlu2 and mGlu4, with either the inactive mGlu2 (2X) or the inactive mGlu4 (4X). (D, E and F), same as in C using mGlu6, mGlu7 or mGlu8 constructs, respectively. Data are means ±SEM (n ≥ 3). **p<0.01, ***p<0.001 (unpaired t test). Using the non-functional mGlu4FS, co-expressed with mGlu2, no signal could be generated upon activation with the mGlu4 agonist L-AP4, in agreement with mGlu4 HD being the G protein-coupling domain in the mGlu2-4 heterodimer (Figure 6A). Consistent with this, activating an mGlu2FS mutant with DCG-IV generated a signal providing this subunit is co-expressed with mGlu4 (Figure 6A). Note that under these experimental conditions, cells expressed three types of dimers, the mGlu2 and mGlu4 homodimers and the mGlu2-4 heterodimer. Accordingly, if mGlu4 was the FS mutated subunit, L-AP4 had no effect, while DCG-IV could generate a signal through mGlu2 homodimers. In contrast, if mGlu2FS mutant was used, DCG-IV could generate a signal through the 2–4 heterodimer, and L-AP4 through the mGlu4 homodimers. Correct expression and function of all constructs was verified (Figure 6—figure supplement 1). 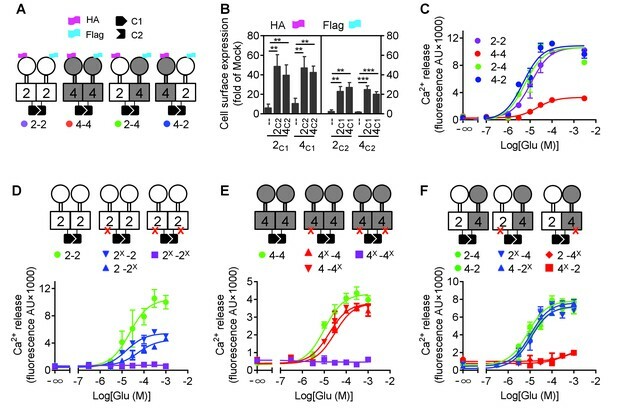 These data confirmed that the asymmetric activation of the mGlu2-4 HDs is not the consequence of the presence of the C1-C2 intracellular domains. The same approach was conducted with all possible heterodimeric receptors made of mGlu2 or mGlu3 associated with any of the group-III mGluRs: mGlu4, 6, 7 and 8. As depicted in Figure 6C–F and Figure 6—figure supplement 2, similar data were obtained with any of these 4 types of heterodimers for mGlu2 and for mGlu3. These data indicate that in all these cases, the group-III subunit is responsible for G protein activation in these heterodimers. As observed with the mGlu2-4 heterodimer (Figure 4), the mGlu2 NAM, MNI137, inhibited signaling of all these heterodimers (Figure 6C–F). This is consistent with the mGlu2 HD, though not directly involved in G protein coupling, being important to allow the group-III subunit to signal in these heterodimeric receptors. Our data revealed important information on how two G protein-activating units communicate within a heterodimeric complex. We found that in the mGlu2-4 heterodimer, only the mGlu4 subunit activates G proteins, and we revealed a complex allosteric interaction between the two HDs. Indeed, the mGlu2 subunit retains its ability to signal providing its activation is favored using mGlu2 PAMs, or preventing the activation of mGlu4 HD with a NAM. Such findings, schematized in Figure 7, will certainly help elucidate the functional control of one GPCR by another, and how this can be modulated, then providing novel opportunities to decipher the role of possible GPCR heterodimers. Scheme illustrating the activation mechanism and allosteric control of mGlu2-4 heterodimer. State 1. the inactive heterodimer in its basal state. State 2: Glutamate (blue disk) activation of both subunits leads to G protein activation by mGlu4 HD, also involving a conformational change in the mGlu2 HD. 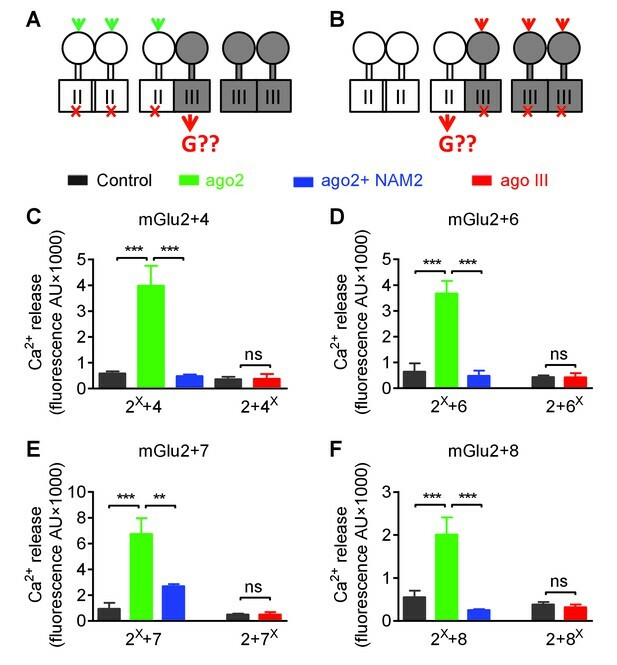 State 3: the addition of mGlu2 NAM (green square) largely decreases coupling efficacy of the mGlu2-4 heterodimer activated by glutamate (3a), or suppress detectable coupling if either the mGlu2 (3b) or mGlu4 (3c) is specifically activated. State 4: heterodimeric mGlu2-4 coupling through the mGlu2 HD thanks to the addition of a mGlu4 NAM (purple square, 4a), or a mGlu2 PAM (yellow triangle, 4b). The key information reported here is that, even though both HDs in the mGlu2-4 heterodimer are capable of activating G proteins, only that of mGlu4 does it (Figure 7, State 2). This is not only observed with the mGlu2-4 but with any other heterodimers made of mGlu2 and a group-III mGlu subunits, where the group-III HD is always responsible for coupling. Such asymmetric activation of a GPCR dimer has often been observed (Vilardaga et al., 2008; Han et al., 2009; Galvez et al., 2001; Duthey et al., 2002; Levoye et al., 2006; Xu et al., 2004). Even in the mGlu homodimers, only one subunit is active at a time, although in that case, each subunit has the same probability of being active (Hlavackova et al., 2012; Hlavackova et al., 2005; Goudet et al., 2005). For the well-characterized heterodimeric GPCRs, such as the GABAB and the T1R taste receptors, also one subunit only is responsible for G protein activation (Galvez et al., 2001; Duthey et al., 2002; Xu et al., 2004), although this was assumed to result from the inability of the other subunit to signal. Our data suggest that instead, the inability of signaling of one subunit may result from an inhibitory effect of the other subunit while in its fully active state. This is indeed likely the case for the GABAB receptor for which the GABAB1 subunit, not involved in coupling in the heterodimer, has been reported to signal when expressed alone (Baloucoune et al., 2012; Richer et al., 2009). Similar asymmetric coupling has also been reported for class A GPCR heterodimers, where the activation of one receptor prevents the activation of the other (Vilardaga et al., 2008; Han et al., 2009; Levoye et al., 2006). These observations reinforce the idea of a strong negative cooperativity between the HDs in a dimeric GPCR complex, where the activation of one subunit suppresses the ability of the other to signal. This conclusion is further supported by numerous studies reporting negative cooperativity in agonist binding on dimeric GPCRs (Albizu et al., 2010; Urizar et al., 2005). While mGlu4 homodimer coupling efficacy measured is lower than that of mGlu2, it is interesting to note that the coupling efficacy of mGlu2-4 heterodimer is similar to that of mGlu2 receptors. Because in both mGlu4 and mGlu2-4, the G protein activation is mediated by the mGlu4 HD, this means that the mGlu2 subunit potentiates mGlu4 efficacy. Such a low coupling efficacy of mGlu4 homodimers may well be the consequence of a weaker action of the mGlu4 ECD dimer on the HDs, consistent with the weaker coupling of heterodimers containing two mGlu4 ECDs (Figure 2). It may also possibly result in part from another level of interaction between the HDs within a dimeric receptor. Even though the mGlu2 HD does not directly activate the G protein in the heterodimer, it is important for the full activation of the mGlu4 HD (Figure 7). Indeed, the mGlu2 HD likely changes its conformation to exert this positive effect, even though this conformation is not sufficient for G protein coupling (Figure 7). This is well demonstrated by the partial inhibition of the mGlu2-4 activity (mediated by the mGlu4 HD) by a specific mGlu2 NAM known to stabilize the mGlu2 HD in its inactive state (Hemstapat et al., 2007) (Figure 7, State 3a). Such an action of the mGlu2 HD is even more prominent if the VFT dimer is asymmetrically activated, with only one VFT occupied by an agonist (Figure 7, States 3b, 3c). Such data revealed important allosteric interaction between two HDs in a GPCR dimer, not expected so far. They are however perfectly in line with the role of the GABAB1 HD in the activation process of the heterodimeric GABAB receptor, the latter being involved in a direct activation of the GABAB2 HD through an intra-molecular conformational change (Monnier et al., 2011). Our data then further strengthen the multiple allosteric interactions between class C GPCR domains in the activation process, with the activation of one HD within the dimer being controlled in two ways. The first one is by the reorientation of the VFTs with an efficient coupling when the reorientation is symmetric (both VFTs activated), and a less efficient coupling in case only one VFT is activated (Moreno Delgado et al., 2017; Kniazeff et al., 2004). Of note, the sequence of the CRDs that link the VFTs to the HDs also plays a role, as indicated here by the differential coupling efficacies of receptor combinations containing either the mGlu2 CRD or the mGlu4 CRD (Figure 2, Figure 2—figure supplement 1, Figure 4D). The second pathway comes from a conformational change in the associated HD likely through a direct interaction between the two HDs in the dimer, consistent with our previous data with the heterodimeric GABAB receptor (Monnier et al., 2011). The second component is higher when the first, VFT mediated, is weak, due either to the activation of only one VFT (Figure 4), or to specific combinations of the CRDs (Figure 2, Figure 4D). Such allosteric interaction most likely results from a contact between the two HDs via an interface that can communicate information from one HD to the other. This can be achieved if the interface involves component of the HD that changes conformation depending on the state of the subunit. Recently, we reported that, even though both HDs in a class C GPCR contact each other through TM4 and 5 in the basal state, as also reported for many class A GPCR dimers (Guo et al., 2005; Manglik et al., 2012), we surprisingly identified TM6 as being involved in the dimer interface of the active receptor dimer (Xue et al., 2015). TM6 is the TM that moves the most during class A GPCR activation (Rasmussen et al., 2011a; Rasmussen et al., 2011b), also likely in class C GPCRs (Pin and Bettler, 2016) for which the allosteric coupling between both HDs in a GPCR dimer is of fundamental mechanistic importance. More work is obviously needed to analyze the TM rearrangement in class C GPCR activation. Another major observation is that it is possible, using small molecules to reorient the G protein coupling from one subunit to the other – i.e. from the mGlu4 HD to the mGlu2 HD in the mGlu2-4 heterodimer (Figure 7, States 4a, 4b). Indeed, by either preventing the activation of the mGlu4 HD with an mGlu4 specific NAM (Figure 7, States 4b), or by stabilizing the mGlu2 HD in its active conformation with a specific mGlu2 PAM (Figure 7, States 4b), the G protein coupling is transferred from the mGlu4 to the mGlu2 subunit. This observation suggests that the mGlu4 HD is likely more prone to reach a G protein activating state than the mGlu2 HD, and the fully active form of mGlu4 HD prevents the mGlu2 HD from reaching a G protein activating state. Such observation opens interesting possibilities to decipher the specific role of each subunit in this mGlu2-4 heterodimer, especially in specific brain area where it is expressed. There is much interest in the development of allosteric modulators, since these are expected to have less side effects for several reasons (Changeux and Christopoulos, 2016; Conn et al., 2014; Foster and Conn, 2017; May et al., 2007). Such small molecules target a site that is under less pressure during evolution, such that it is possible to identify subtype selective molecules, in contrast to compound acting in the orthosteric binding site highly conserved between homologous receptors. In addition, PAMs do not constantly activate the receptor, then do not favor receptor desensitization and internalization. Moreover, because they enhance the action of endogenous ligands, they increase the response when and where needed for an improved physiological response. Here we reveal a novel property of such small molecules: their ability to control the asymmetric activation of a GPCR dimer. Taken together, the present study illustrates the complex allosteric interaction occurring between two associated G protein-activating units, with both positive and negative interactions. Indeed, a conformational change in one subunit is needed for a full G protein activation by its associated subunit, although the interaction also prevents the first subunit from activating G proteins. Because more and more data are consistent with the existence of GPCR heteromers, our finding will certainly bring much interest in elucidating their possible roles in integrating signals targeting either subunit. L-glutamate was purchased from Sigma. DCG-IV, L-AP4, MNI137 and LY487379 were from Tocris Bioscience. LSP4-2022 was a provided by Dr. F. Acher (Paris, France). Glutamate-pyruvate transaminase (GPT) was purchased from Roche. Lipofectamine 2000 and Fluo-4-AM were from Life Technologies. SNAP-Green was from NEN Biolabs. The pRK5 plasmids encoding the HA-tagged wild-type mGluR2-3-4-6-7-8 from rat were described previously (Huang et al., 2011). The site-directed mutations in the pRK5 plasmid were generated using QuikChange mutagenesis protocol (Agilent Technologies). The sequence coding C1 (the 47-residue coiled-coil sequence of the C-terminal of GABAB1), or C2 (the 49-residue coiled-coil region of GABAB2), followed by the endoplasmic reticulum retention signal KKTN. HAmGluR2C1KKXX (2C1) and FlagmGluR2C2KKXX (2C2) (with and without a N-terminal SNAP tag) have been reported previously (Xue et al., 2015). Using the same strategy, the last 38 residues in mGluR4 C terminus (HA, flag and SNAP-tagged versions of mGlu4 were used) were replaced by C1KKXX or C2KKXX to obtained HAmGluR4C1KKXX (4C1), FlagmGluR4C2KKXX (4C2). The chimeras (2VFT4HD, 4VFT2HD) were obtained by introducing a Bgl II restriction site in both mGlu2 and mGlu4 subunits, Ala497Arg mutation in mGluR2 and same sense mutations at Arg517Ser518 in mGluR4 were induced to make the restriction site. Chimeras (2ECD4HD, 4ECD2HD) were obtained by exchanging the ECD domain before the Pro557 in mGluR2 and Pro577 in mGluR4. HEK-293 cells (ATCC, CRL-1573, lot: 3449904) were cultured in DMEM supplemented with 10% FBS and transfected by electroporation as described elsewhere. Absence of mycoplasma was routinely checkedusing the MycoAlert Mycoplasma detection kit (LT07-318 (Lonza, Amboise, France), according to the manufacturer protocol. Ten millions cells were transfected with 2 μg of each plasmid of indicated and completed to a total amount of 10 μg with the plasmid encoding the pRK5 empty vector. To allow efficient coupling of the receptor to the phospholipase C pathway, cells were also transfected with the chimeric G protein Gαqi9 (1 μg) or Gαqo (1 μg), and the glutamate transporter EAAC1 (1 μg). For cell-surface expression and functional assays of indicated subunits, experiments were performed after incubation for 36 hr (12 hr at 37°C, 5% CO2 and then 24 hr at 30°C, 5% CO2). Cells after electroporation, adherent HEK293 cells plated in 12-well plates were labeled with 300 nM SNAP-Green in culture medium at 37°C for 1 hr. Cells were lysed with lysis buffer (50 mM Tris-HCl, pH 7.4, 150 mM NaCl, 1% Nonidet P-40, 0.5% sodium deoxycholate, 0.1%SDS and protease inhibitors) at 4°C for 1.5 hr. After centrifugation at 12,000 g for 30 min, supernatants were added with loading buffer (NuPAGE LDSsample buffer 4, Invitrogen) for 10 min. Electrophoresis was performed using precast NuPAGE Novex 8% Tris-acetate gels (Life Technologies) and blotted onto nitrocellulose membranes. Membranes were imaged on an Odyssey infrared scanner (LI-COR Biosciences, Lincoln, NE, USA) at 800 nm for SNAP-Green (Xue et al., 2015). Cell surface expression of the indicated subunits was detected by ELISA. HA- and Flag-tagged subunits were co-transfected into HEK293 cells seeded into 96-well microplates. Cell surface expression and total expression (treated with 0.05% triton) was detected with a monoclonal rat anti-HA antibody (3F10, Roche) or rat anti-Flag (F1804, Sigma) and a goat anti-rat second antibody coupled to HRP (Jackson Immunoresearch, West Grove, PA) as previously described (Monnier et al., 2011). Bound antibody was detected by chemoluminescence using SuperSignal substrate (Pierce) and a 2103 EnVision Multilabel Plate Reader (Perkin Elmer, Waltham, MA, USA). Intracellular Ca2+ release was measured as described (Hlavackova et al., 2005). In brief, cells were pre-incubated for 1 hr with the Ca2+ -sensitive Fluo-4 acetoxymethyl ester (Invitrogen). The fluorescence signals (excitation at 485 nm and emission at 525 nm) were then measured for 60 s (Flex-Station, Molecular Devices). Agonist was added after the first 20 s. The Ca2+ response is given as the agonist-stimulated fluorescence increase. Concentration response curves were fitted using Graph Pad Prism. Inositol phosphate (IP) accumulation in HEK293 cells co-transfected with indicated subunits was measured after stimulation with agonist for 30 min in 96-well microplates as previously described (Hlavackova et al., 2005). After incubation in the presence of LiCl (10 mM, 30 min) and termination of the reaction with 0.1 M formic acid, the supernatant was recovered and purified by ion exchange chromatography using DOWEX resin. Radioactivity was measured using a Wallac1450 MicroBeta microplate liquid scintillation counter (Perkin Elmer, Waltham, MA, USA). Statistical analyses were performed on at least three individual data sets analyzed by Graphpad prism using unpaired t-tests. Journal of Biological Chemistry 273:25765–25769. The Journal of Physiology 592:2439–2441. Journal of Biological Chemistry 282:33000–33008. Nature Reviews Drug Discovery 13:692–708. Journal of Biological Chemistry 277:3236–3241. Annual Review of Pharmacology and Toxicology 56:403–425. Journal of Biological Chemistry 280:24380–24385. Journal of Pharmacology and Experimental Therapeutics 322:254–264. Nature Structural & Molecular Biology 11:706–713. Nature Reviews Drug Discovery 7:339–357. The Journal of Physiology 592:2443–2445. Current Opinion in Pharmacology 10:6–13. Journal of Molecular Neuroscience 38:67–79. Journal of Biological Chemistry 281:24653–24661. G protein-coupled receptor dimers: look like their parents, but act like teenagers! Journal of Receptors and Signal Transduction 33:135–138. Thank you for submitting your article "Allosteric control of an asymmetric transduction in a GPCR heterodimer" for consideration by eLife. Your article has been reviewed by three peer reviewers, one of whom is a member of our Board of Reviewing Editors and the evaluation has been overseen by Richard Aldrich as the Senior Editor. The following individual involved in review of your submission has agreed to reveal his identity: Dmitry Veprintsev (Reviewer #2). 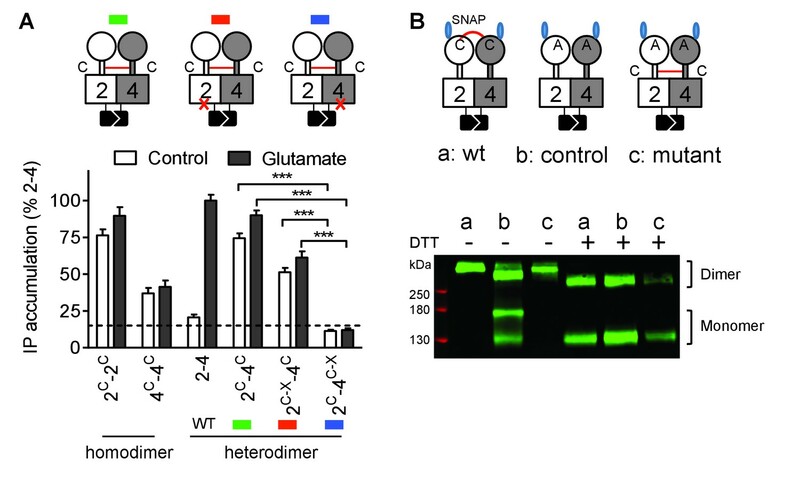 This manuscript reports an investigation of the allosteric control between subunits in a heterodimer of metabotropic glutamate receptor 2 and 4, using an elegant and ingenious quality control system that assures surface expression of only the intended dimers. The study reports asymmetric activation of dimeric metabotropic glutamate receptors, such that if a mGlu2 subunit is present, mGlu4 is responsible for the G protein activation in the heterodimer. By using subtype specific agonists, as well as swapping the extracellular domains between the subtypes, the authors were also able to show that it is possible to activate signaling by the heterodimer via activation of the mGlu2 extracellular domain. Using constitutively-active cross-linked extracellular domains the authors also demonstrate that no matter how the extracellular domains are activated, it is the mGlu4 that is responsible for signaling. The reviewers are enthusiastic about the manuscript. However, they raise a number of concerns that must be adequately addressed before the paper can be accepted. 1) Two of the reviewers raise serious doubts about the interpretation of the molecular dynamics simulations. These concerns can be summarized as: (1) the fluctuations of loop regions in a homology model during a simulation could have many origins unrelated to the activation mechanism, and since appropriate methodological details were not provided [the sequence identity of the template; the final alignment and curations of the alignment; the loop lengths and templates; structural reliability measures for those segments; providing the model as supplementary material], it is not clear that the models are sufficiently reliable in these regions to avoid such artifacts; (2) even if the models were reliable, it is entirely possible that differences in fluctuations of ~1 Å would not be robust to repeated, parallel simulations (n>1); and (3) critically, the underlying assumption that asymmetric dynamics in a dimer should be detectable as fluctuations on the timescale of microseconds in the monomer is speculative. For these reasons, this section of the manuscript should be removed before resubmission, and the conclusions adjusted accordingly. 2) The overall message of the manuscript should be communicated more consistently throughout the manuscript. In particular, from the data and from the discussion it is clear that some conformational change, but maybe not the full activation of mGlu2, is required for the allosteric activation of the mGlu4. In other places (abstract, end of introduction) this effect is described too simplistically as 'negative cooperativity'. In addition, the statement in the abstract: 'revealed a dynamics "winner-take-all" mechanism in mGlu heterodimers, providing new insight on the allosteric control between subunits in a GPCR dimer’ implies some kinetic aspects and time-resolution of the measurements while no kinetic measurements were presented. Rewording this statement could help avoid confusion. 3) Cell-surface expression levels are not always clearly reported. Statistical analysis of the expression levels would aid in interpretation of the results, specifically in Figure 1—figure supplement 2 and Figure 2—figure supplement 2 and 3. Similarly, in Figure 1B, cell surface expression is only statistically compared with mock and not among the different heteromers. In this case, the data look similar, but this does not seem to be the case for several of the supplemental figures (see below). 4) Figures 1, 2, 4 and 5 show the same type of data but use different Y axes (Fluorescence units or fold change over Mock, or normalised to the highest value). This makes it difficult to compare the experiments. It would be better to use the same Y axis – whichever is the most informative. 5) Figure 1C and F – the signal amplitude for the 2-4 heterodimer seem to be inconsistent on these two panels while it is consistent on others. 6) Figure 4A and B – The data presented are inconsistent with the previously presented data (compounded by the use of a different normalization along Y) and with the statement that the signaling is mediated via mGlu4. In the presence of NAM and a deactivating mutations signaling was observed. Panel D: are the differences in Ca2+ release between the two different 2-4 heteromers statistically significantly different? And if so: what could be an explanation for this (it seems that the inhibition of Ca2+ release is less profound when CRD is also from mGlu2)? 7) A more in-depth discussion of the following results is required:a) While it is concluded that the allosteric control of signaling is mediated via the 7TM domains, it is also worth discussing the possibility that some allosteric control could be mediated via the 7TM-VFT1-VFT2-7TM path, and only via the direct 7TM-7TM path. Three must be bi-directional allosteric connections between the 7TM and the VFT domains, and the allosteric coupling between the individual VFT domain has also been shown by the authors themselves. b) In Figure 1C: glutamate has a lower efficacy at mGlu4-4 compared to 2-2, 2-4, 4-2. Is that because 2 positively affects 4? This matter is not discussed. The high efficacy (Ca2+ release) of 2-4 and 4-2 in Figure 1C is not seen in Figure 1F. c) In Figure 1D: why does mutation of one of the two monomers in mGlu2-2 lead to a larger decrease in glutamate efficacy than in mGlu4 dimers? Does mGlu2-2 couple to 2 G-proteins to reach highest activity, in contrast to mGlu4-4, 4-2 or 2-4 for which coupling to 1 G-protein is sufficient? Again, the use of different y-axes complicates ready comparison. d) In Figure 1—figure supplement 3 C: why are there differences between 2x-4 and 4-2x? Could this be due to differences in expression level? e) In Figure 2: the receptors consisting of VFT and CRD derived from mGlu2 consistently show a higher Ca2+ release. This fact is not discussed. f) In Figure 3, it is not clear why IP accumulation is monitored in this particular experiment as opposed to Ca2+ release in the others. g) In Figure 3—figure supplement 1, there are differences in expression levels: do they correlate with efficacy? Thank you for submitting your revised work entitled "Allosteric control of an asymmetric transduction in a G protein-coupled receptor heterodimer" for consideration by eLife. Your revisions and responses have been reviewed by a Reviewing Editor, and the evaluation has been overseen by a Senior Editor. We are willing to accept the manuscript for publication, provided that the molecular simulations are excluded. Although the nominal accuracy of the models on which the simulations are based appears to be reasonable (50% identity, high coverage), thereby addressing one of our previous concerns, it remains questionable whether the conclusions extracted from these simulations are sufficiently robust and convincing. The fundamental claim that microsecond-scale fluctuations of these two intracellular loops relate to the activation of a ligand-bound dimer is speculation – particularly for an apo, monomeric receptor. Critically, this claim is also not convincingly supported by the simulation data provided, based on the information added to the revision. Only one MD trajectory was calculated for the mGlu2 model, and although the trajectories are 5 microseconds-long, analysis of RMSD versus time shows the models continue to drift away from the starting structure throughout the simulation; therefore, it is unclear whether the observed fluctuations reflect functional dynamics or inaccuracies of the models. Indeed, no molecular explanation is given as to why one protein is "more dynamic" than another, leaving open the strong possibility that this difference owes to the differences in the quality of the models or how the simulations were set up or conducted. On top of this, the simulations include an apo monomer, rather than a ligand-bound dimer whose actions are being monitored in the experiments. In summary, the molecular simulations are insufficient to support the hypothesis put forward, and the relevance of the observations is too tenuous. It is our opinion that the speculation of the underlying mechanism for activation of mGlu4 vs mGlu2 is equally plausible without the simulations. – There is no reference to rat mGlu2 being used in the abstract, as indicated in the response regarding the title. – In the Discussion section: The phrase: "the consequence of the mGlu4 ECD dimer", is confusing and possibly incomplete, since it refers also to data relating to mGlu2. We agree with the referees that molecular modeling and especially MD simulations on 3D models highly depend on the quality of the models, and on the conditions used to conduct the molecular dynamics. We agree also that such data remains theoretical and can thus be criticized, unless supported by experimental data. In addition, we are well aware that the dynamics studies were performed using isolated HDs, not with the heterodimer. As such only part of what is undergoing is being analyzed since our studies did not consider the influence of one HD partner on the dynamics of the other. With this in mind, and despite these well-deserved criticisms, we still consider our modeling study brings an interesting idea (not a conclusion) on what is possibly going on, leading to the G protein activation by one subunit (mGlu4) and not the other. We then propose to keep these data (now transferred to Appendix 1), supported by additional information, but we have modified our text, both results and discussion, to take such criticism into account, and to help the reader interpret these data with a degree of caution. We have added more data to illustrate how the 3D models were generated, and how they have been validated (seq alignment details, templates, loop lengths etc.). We can also include homology model coordinates for the reviewer(s) to inspect (as separate files). Of note, the mGlu HDs share a similar target-template sequence identity (about 50%), such that 3D models are relatively accurate according to the actual methods used to generate them, especially the helices and their assembly. Specifically, an extra analysis of secondary structure has been included, which shows both 3D models have high structural stability during simulations. Recently, we used a similar approach to study the mode of action of the allosteric modulator MPEP that led us to propose a model to explain why MPEP is a NAM on mGlu5, and a PAM on mGlu4 (Dalton et al., 2017). Because of the maintained symmetry at the level of the VFT, we speculated that the asymmetry at the level of the HD dimer comes from specific properties of the HD domains. One possibility being that the mGlu4 HD can reach the active state more easily, then requiring less energy, and as a consequence prevented the mGlu2 HD from reaching a fully functional state. Then, our in silico analysis mainly focused on the ability of the HD core to spontaneously “open” on its intracellular side, as an isolated domain in a lipid bilayer. In this respect we measure both distances between key intracellular loops and between key TM helices (the latter is a new addition). We find these measures to be related, although the difference between loops is more marked than between helices (~7 Å compared to ~2.5 Å). We also found that the mGlu2 3D model is more stable conformationally in its initial inactive state than mGlu4. Because both models were generated using the same methodology with similar target-template seq IDs, and were tested under the same in silico conditions (over long time periods), such an observation is consistent with our proposal. Even with the limitations mentioned above, we think these data provide a way for the reader to better understand what is possibly going on. It may also enable more focused future studies, either by ourselves or by others. Our observation that mGlu2 HD undergoes a conformational change, not sufficient for G protein activation, but necessary for a full activity of the mGlu4 HD is now presented clearly at the end of the introduction and at the beginning of the discussion. We extended a little the abstract to also indicate this point: “Such asymmetric transduction goes through both a direct activation of mGlu4 heptahelical domain (HD) by the dimeric extracellular domain, and an allosteric activation by a partially-activated non-functional mGlu2 HD”. In addition, the statement in the abstract: 'revealed a dynamics "winner-take-all" mechanism in mGlu heterodimers, providing new insight on the allosteric control between subunits in a GPCR dimer' implies some kinetic aspects and time-resolution of the measurements while no kinetic measurements were presented. Rewording this statement could help avoid confusion. We also modified the “One sentence summary” from “In mGlu heterodimers, the subunit that reaches first the active state couples to G protein, and prevents the other from signaling “to “In mGlu heterodimers, an oriented asymmetrical activation revealed complex allosteric interaction between subunit”. The figures reporting the cell surface expression have been simplified (we removed the total expression determined after cell permeabilization since these data did not bring much information), and made clearer to read. The main aim of these measurements was to check whether non-functional receptor dimer combinations were indeed expressed at the surface, to be able to conclude these receptors are not capable of activating G protein upon agonist stimulation. However, due to a non-linear relationship between cell surface expression and Fluo4 fluorescence intensity, we did not attempt to use this information to determine precisely the coupling efficacy of any given receptor combination. To do so, we should be sure we are in a linear relationship for both the signaling response measured and the cell surface receptor generated signal. By experience, we should use the IP One assay, rather than the Fluo4 assay, and use SNAP-tag surface labeling rather that sandwich ELISA for the cell surface quantification. Accordingly, we did not attempt to determine whether the variations on cell surface expression could be significant. Data in most figures are now raw data, expressed as the fluo4 fluorescence signal amplitude, as determined with a flexstation (Figures 1, 2, 5 and 6). 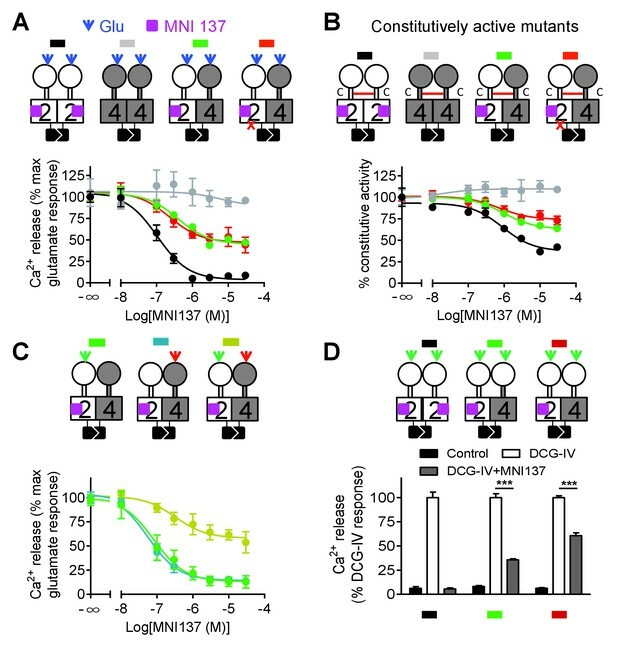 We however kept the normalized representation (% of maximal Glutamate effect, or% of constitutive activity) in Figure 4 in order to make clear the differential effect of the mGlu2 NAM MNI137 on the different receptor dimer combinations. We apologize for this, since the original panel Figure 1F corresponded to an experiment where a different transfection protocol was used (lipofectamine, instead of electroporation). We now replaced this panel with data obtained under the same conditions as in the other panels, and as reported in the Materials and methods section. Note however, that differences can still be observed that correspond to variations between individual experiments as expected because of the transient transfection procedure. Since we decided to show raw data, we present data corresponding to means of triplicates from a typical experiment. Each experiment was reproduced at least three times. The mean potencies and relative maximum calculated from n independent experiments are indicated in Figure 1—source data file 1. 6) Figure 4A and B – The data presented are inconsistent with the previously presented data (compounded by the use of a different normalization along Y) and with the statement that the signaling is mediated via mGlu4. In the presence of NAM and a deactivating mutations signaling was observed. We apologize for the mistake in Figure 4A and B. This is obviously not the mGlu4 subunit that was made incapable of signaling, but as stated in the text, the mGlu2 subunit. Indeed, the referee is correct, when the mGlu4 subunit is mutated, no signal can be measured, and then, no inhibition by MNI137. The figure has been corrected. Panel D: are the differences in Ca2+ release between the two different 2-4 heteromers statistically significantly different? And if so: what could be an explanation for this (it seems that the inhibition of Ca2+release is less profound when CRD is also from mGlu2)? The referee is right, MNI137 induced a smaller inhibition (39.2 ± 4.7%, n=3) when both CRDs are from mGlu2, compared to the situation where the mGlu4 HD is associated with the mGlu4 CRD (64.3 ± 3.8% inhibition, n=3, p<0.05). If we accept the idea that they are two main allosteric pathways leading to the mGlu4 HD activation, one coming from the mGlu2 HD, the other from the VFT dimer, we can propose that the VFT dimer component (that insensitive to MNI137) is higher in the receptor combination containing both CRDs from mGlu2. In other words, this suggests a better activation of the HDs by the dimeric mGlu2 ECDs. The influence of the CRD type in receptor activation in now discussed in our revised manuscript in a new paragraph added in the discussion. We have added a paragraph in the discussion to make this point clearer. It is true that using this Gqi9-mediated signaling assay, the mGlu4 homodimer displays a lower efficacy compared to the mGlu2 homodimer and mGlu2-4 heterodimer. This is consistent with data presented in Figure 1—figure supplement 1, and Figure 6—figure supplement 1 (previously Figure 7—figure supplement 1). As indicated by the referee, the simplest explanation is that the mGlu2 subunit increases the G protein-coupling efficacy of the mGlu4 HD. Alternatively we think this may simply be a specific property of the group-III dimeric VFTs. Indeed, the dimers in which both ECDs are from mGlu4 display a lower efficacy (see Figure 2 and Figure 6—figure supplement 1). A comparison with the data in Figure 2—figure supplement 1 even highlights the dimeric mGlu4 CRDs as being important for the low coupling efficacy. More work is clearly needed to better understand this observation. This is now discussed in the revised manuscript at the beginning of the third paragraph of the discussion. Regarding the apparent efficacy difference between Figure 1C and 1F, see our answer to the main point 5 above. The referee is correct, mutating one subunit in mGlu2 dimer decreased receptor efficacy to 50% of the WT (Figure 1—source data file 1) as already reported with mGlu1 (Hlavackova et al., 2005). Such a decrease in signaling is proposed to be the consequence that only one HD is active at a time, with an equal probability of each subunit to reach an active state (see also Goudet et al., 2005). As such, a receptor dimer in which the mutated HD is in an active conformation does not couple, then leading to a decrease in coupling efficacy by about 50%. According to this proposal, the mutated HD does not activate the G protein, but is still able to reach an active conformation. It is then interesting to note that a lower decrease in efficacy is observed with mGlu4 upon mutation of one subunit (Figure 1—source data file 1). We added a new column in the table Figure 1-source data file 1 where the means maximal responses are presented. More work will be needed to understand why, but we can propose that the loss of function mutation on mGlu4 ic3 not only prevents G protein activation, but also reduces the ability of the HD to reach the active state, such that in the case of a mGlu4 dimer with only one subunit mutated, the wild-type HD will be more keen to activate G protein. We think it is not necessary to describe such a speculative hypothesis in the discussion. d) In Figure 1—figure supplement 3C: why are there differences between 2x-4 and 4-2x? Could this be due to differences in expression level? It is true that in the presented experiment, DCG-IV generated a larger response on the 2xC1-4C2 receptor, than the 2xC2-4C1 receptor when the Gqi coupling is being analyzed. Note that such a difference is found neither when both DCG-IV and L-AP4 are applied (suggesting there is no major difference in expression level), nor when coupling to Gqo is being analyzed. When analyzing the data from the two other experiments performed, no such difference was found. The referee is correct, any receptor combination made of two mGlu4 VFTs display a lower Ca2+ response, this is also the case for any other group-III mGluRs. See our answer to main point 7(b) above. f) In Figure 3: it is not clear why IP accumulation is monitored in this particular experiment as opposed to Ca2+ release in the others. In this figure, we analyzed the coupling capacity of receptor dimer combinations that are made constitutively active through a disulfide bond linking the CRDs in an active position. Because Ca2+ signals are transient, and return close to basal values after few minutes of constant activation, the constitutive activity of Gq coupled receptors cannot be measured with Fluo4 fluorescence assay. We then turned to the quantification of IP1 that can start to accumulate due to the constitutive activity of the mutant receptor, as soon as we block the IP1 degrading enzyme with LiCl. The reason for the choice of this assay is now clearly explained in the Results section. g) In Figure 3—figure supplement 1: there are differences in expression levels: do they correlate with efficacy? The surface expression levels were primarily measured to check whether non-functional combinations were indeed expressed at a correct level. Unfortunately, the relationship between the expression at the surface and the Fluo4 signal is not linear, due to a rapid saturation of the Ca2+ transient. Then trying to correlate expression level with maximal response in the Ca2+ assay is rather complex, and I think, not needed for the main take home message of this manuscript. We are willing to accept the manuscript for publication, provided that the molecular simulations are excluded. Although the nominal accuracy of the models on which the simulations are based appears to be reasonable (50% identity, high coverage), thereby addressing one of our previous concerns, it remains questionable whether the conclusions extracted from these simulations are sufficiently robust and convincing. The fundamental claim that microsecond-scale fluctuations of these two intracellular loops relate to the activation of a ligand-bound dimer is speculation –particularly for an apo, monomeric receptor. Critically, this claim is also not convincingly supported by the simulation data provided, based on the information added to the revision. Only one MD trajectory was calculated for the mGlu2 model, and although the trajectories are 5 microseconds-long, analysis of RMSD versus time shows the models continue to drift away from the starting structure throughout the simulation; therefore, it is unclear whether the observed fluctuations reflect functional dynamics or inaccuracies of the models. Indeed, no molecular explanation is given as to why one protein is "more dynamic" than another, leaving open the strong possibility that this difference owes to the differences in the quality of the models or how the simulations were set up or conducted. On top of this, the simulations include an apo monomer, rather than a ligand-bound dimer whose actions are being monitored in the experiments. In summary, the molecular simulations are insufficient to support the hypothesis put forward, and the relevance of the observations is too tenuous. It is our opinion that the speculation of the underlying mechanism for activation of mGlu4 vs mGlu2 is equally plausible without the simulations. As requested, we removed any reference to the MD simulations presented in Appendix 1, and of course we also removed the Appendix 1 and the related figures and files of the 3D models. The first sentence of the abstract has been modified as requested. We also added in the abstract that we worked with the rat mGluR sequences. We modified the sentences in the Discussion section, as follow: "Such a low coupling efficacy of mGlu4 homodimers may well be the consequence of a weaker action of the mGlu4 ECD dimer on the HDs, consistent with the weaker coupling of heterodimers containing two mGlu4 ECDs (Figure 2)". This work was supported by the National Natural Science Foundation of China (NSFC grant nos. 31100548 to SH, and 31420103909, 31711530146, 31511130131), the Program of Introducing Talents of Discipline to the Universities of the Ministry of Education (grant no. B08029), Natural Science Foundation of Hubei province (grant no. 2014CFA010) and the Mérieux Research Grants Program of Institut-Mérieux (to JL). JPP was supported by the Centre National de la Recherche Scientifique, the Institut National de la Recherche Médicale and by the Fondation pour la Recherche Médicale (grant no. DEQ20130326522), and CisBio bioassays. JG was supported by the Ministerio de Economía y Competitividad (ERA-NET NEURON PCIN-2013–018 C03-02 and SAF2014-58396-R). Metabotropic glutamate receptors (mGluRs) are mandatory dimers playing important roles in regulating CNS function. Although assumed to form exclusive homodimers, 16 possible heterodimeric mGluRs have been proposed but their existence in native cells remains elusive. Here, we set up two assays to specifically identify the pharmacological properties of rat mGlu heterodimers composed of mGlu2 and 4 subunits. We used either a heterodimer-specific conformational LRET-based biosensor or a system that guarantees the cell surface targeting of the heterodimer only. We identified mGlu2-4 specific pharmacological fingerprints that were also observed in a neuronal cell line and in lateral perforant path terminals naturally expressing mGlu2 and mGlu4. These results bring strong evidence for the existence of mGlu2-4 heterodimers in native cells. In addition to reporting a general approach to characterize heterodimeric mGluRs, our study opens new avenues to understanding the pathophysiological roles of mGlu heterodimers.